Disney started in Kansas City around 1919, when a teenage Walt Disney got work as a commercial artist and met another young artist Ub Iwerks. They worked for a time at the Kansas City Film Ad Company, learning much of the basics of animation as it was at that time. Walt soon tried independant ventures working on short items for Newman's Laugh-O-Grams and by 1922 he was making full length cartoons like "Cinderella" and "Puss In Boots". By now he had assembled a small animation staff including Ub Iwerks, Hugh Harman and Rudolf Ising. Overspending on the productions meant Walt was soon out of business, but unperturbed he produced a pilot for a new series Alice in Cartoonland - a combination of real life and animation. Clinching a deal with distributor M.J. Winkler he moved his team to Hollywood and started a small studio with brother Roy as business manager. Soon they had moved onto a new series Oswald the Rabbit with Ub Iwerks taking on the actual artistic work, leaving Walt free to concentrate on marketing and production. During 1928 there was a major problem when the distributors refused to increase the amount paid for each film and as the distributors owned the copyright, actually pinched most of Walt's staff to continue the series separately. At this point Walt Disney vowed always to retain the copyright in all future productions. Disney and Ub worked on ideas for a new character and Mickey Mouse was born. 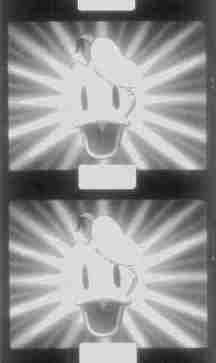 Much of the animation was very similar to that used for Oswald Rabbit. After a couple of films, Walt Disney decided the time had come to attempt to make the cartoons with sound. The success of "Steamboat Willie" assured their future in the cartoon industry. It was no doubt due to Walt Disney's shrewd appreciation of the market place (first synchronised sound, then exclusive cartoon contract for three colour Technicolor), plus his insistence on perfection, that made his product stand out from the rest. Soon the Disney studios were the leaders in animation, using new techniques and later introducing feature length cartoons. We are very lucky that a good selection of the Disney product appears on 9.5mm. Again we in the UK must be thankful to the pre-war French manager of Pathéscope to clinch the original deal with the Disney organisation. The Pathéscope Monthly announced the arrangement with Disney in the August/September 1935 edition with three titles - M.30168 "Down On the Farm" (an almost complete 200 foot/60metre); D.30136 "On With the Show" and L.30124 "That Bracing Sea Air" (60foot/15metre & 30foot/10metre shorts). Disney cartoon releases continued on UK 9.5mm with a vengeance right up to the collapse of Pathéscope in 1960. Pathé-Baby in France had no Disney Mickey Mouse cartoons, but a number of the Alice films were released under the name of Gigoto.... - France had to wait till after the second world war when Film Office were able to offer a range of Disney cartoons on 9.5mm, but shortened to 100 foot (30 metre) versions - losing much of the story in the process. 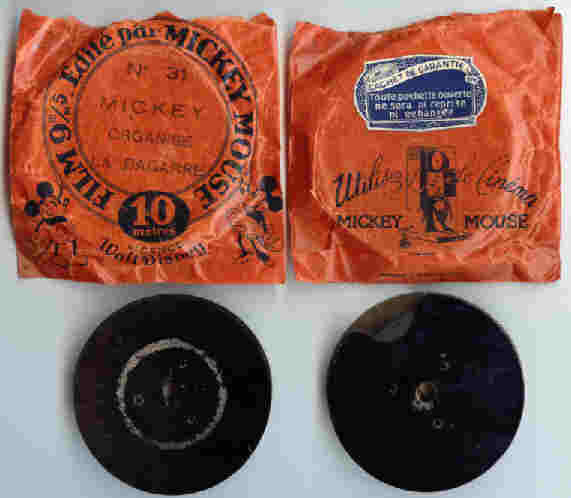 I came across another French source of Disney Mickey Mouse cartoons in 2009; these are short 30 foot / 10 metre extracts from longer releases, spooled on tiny non-standard metal spools - they have a circular hole on one side (smaller diameter than normal 9.5mm spool spindles!) and a small oblong slot on the other side, presumably for a special take-up on the toy projector illustrated on the back of the packets. Despite the 'licence Walt Disney' printed on the front of the packets, I'm sure Disney didn't licence these little films as the quality appears quite poor. In the UK most Disney cartoons were offered by Pathéscope in 200foot (60metre) versions which were slightly shortened. In fact a few titles in the UK did arrive virtually complete as 300foot (100metre) versions. In addition many 60foot / 20metre and 30 foot / 10 metre extracts were also released, each properly titled, normally taken from one of the longer releases, although in some cases only the short little extracts were released. In fact by the 1950s there were also some 100 foot /30 metre extracts released. 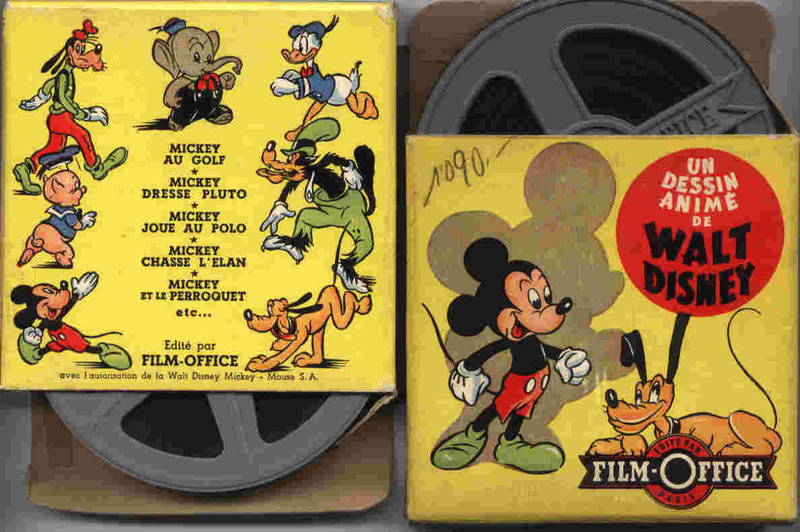 It has been said that these Disney shorts were the mainstay of Pathéscope printed film sales in the later years. 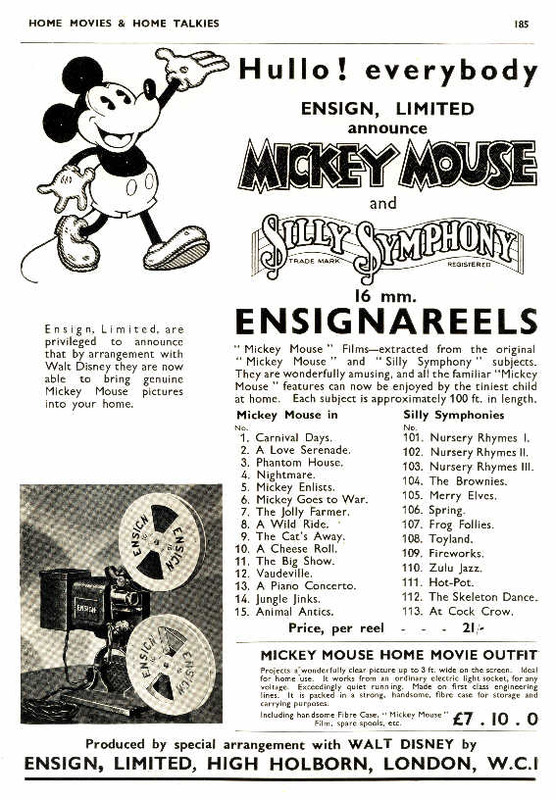 Although not mentioned in the Pathéscope Monthly house magazine or the Pathéscope 9.5mm printed film catalogues; Pathéscope produced quite a large range of Disney cartoon extracts among the llttle 15 foot / 5 metre films issued for the Bingoscope 9.5mm toy projectors marketed in the UK. These short clips were not properly titled, although a reference number and film title was written on the short film leader. These 15 foot shorts were not supplied on spools, just as a little roll of film, attractively boxed. There are separate film lists of these titles to be found in the Bingoscope 9.5mm film catalogue. The major losses to ninefivers were the beautifully arranged musical soundtracks and colour. Only silent prints were offered of the Disney subjects. 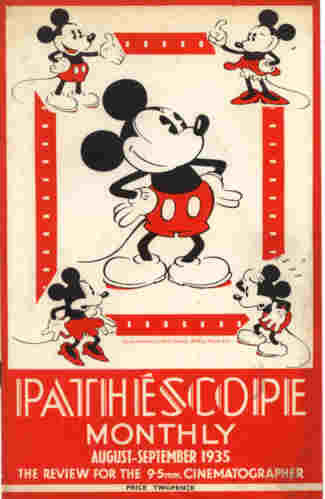 By 1957, Pathéscope had test marketed four Disney cartoons in colour but abandoned the idea because of low sales - these 100foot/30metre shorts were printed on Gevacolour camera stock - remaining prints have faded almost to nothing. 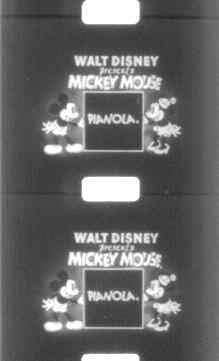 Pathéscope also printed up a test optical sound title "Donald's Gold Mine", but Disney still refused to allow sound releases on 9.5mm. In any case 9.5mm business was fading, with Pathéscope going into receivership in 1960 and that was the end of Walt Disney cartoons on 9.5mm in the UK. There are many other links below (in fact most Disney cartoon shorts are on You Tube) but remember you can buy excellent DVD boxed sets! Note - the You Tube links are to the original full length Disney cartoons, many in Technicolor, not 9.5mm prints. 1 D(PA)30245 DONALD DUCK                             Animated  B/W Mute    DY      4? 26Apr2009 - 60ft "Barn Dance" actually from "The Shindig" 1930 - thanks Maurice Trace! 01June2011 - French 30ft 'Mickey Mouse' series added - extra titles welcomed / plus titres svp! 18Oct2017 - Decided "Donald's Disgiuse" is from "Donald's Ostrich" - blame me if it's wromng!